Book Reviews: A Three-Dimensional Model of Human Behavior By Michael Pak, M.D. Based on his experience in living in different parts of the world, Dr. Pak uses fictitious lively characters to illustrate various modes of behavior. Students and teachers of the behavioral sciences will find useful insights and a new angle on predicting human behavior while the general public will be entertained, informed, and find simple stories and illustrative graphs about common human misunderstandings no matter what culture one’s from or working with, and a models to immediately implement in their lives. “Left-shifted” cultures are characterized by aggressive behavior which members of these cultures do not see as representing strong hostility. In “right-shifted” cultures, less passionate actions are the rule, and members of such cultures tend to misinterpret “left-shifted” behaviors, assigning them excessive meanings on the “friendship-hate” scale. The author uses his model to describe another type of behavior: “right-shifted cultures tend to express friendship or antagonism in an indirect, covert manner.” Therefore, his model requires another axis [Z axis], that contains indirect and covert behavior. One manifestation of the third dimension is conspiracy… He further describes the potential problems caused by clashes between “right-shifted” and “left-shifted” cultures. The author concludes his book with a claim that “the model can likely be used with a high degree of certainty to predict the probability of behavior types (cooperative, neutral, hostile, direct, indirect) and their magnitude.” It should be noted that these conclusions, although only nominal, represent an accurate and brilliant description of the phenomenon. Although Dr. Pak, a physician by training, is not a social psychologist, he offers an interesting set of his own views, an illustration of dynamics of interpersonal and inter-group relations. 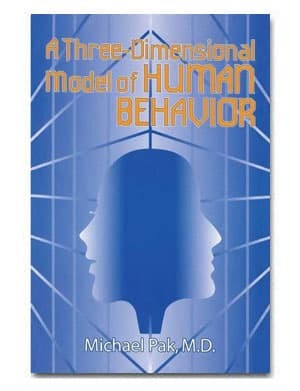 In this book, he contends that human behavior among individuals and groups, in all its diversity, can be explained through a “three-dimensional model of behavior.” The author believes that interactions and relationships between people (groups and states) are a linear phenomenon which depends, on one hand, on the perception or interpretation of the other person’s (or group’s) behavior—on the Y axis—and on the other hand, on the culture to which the person belongs—shown on the X axis of this model. However, in the author’s opinion, those two axes, a two-dimensional model is not sufficient, since indirect and covert modes of behavior also exist, which form the third dimension, or Z axis of the model. The model offered by Pak is surprisingly simple and easy to use. Also surprising is the author’s fine perception of relationships across cultures… To explain his views, he provides a series of very interesting novellas whose characters act according to the model. Without a doubt, this book should be made available to a wide readership.